How I came up with (spacer springs) Plan/idea. 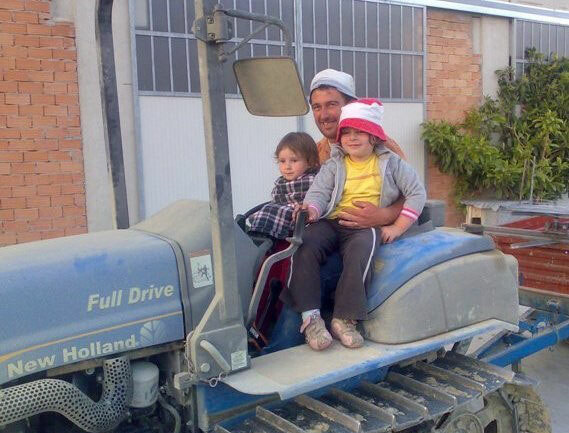 My name is Caffa Marino, I am the owner of Caffa Marino Agro Farm. 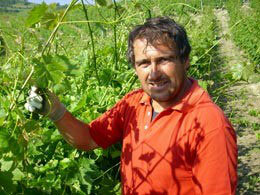 It's located in Mango in the Province of Cuneo, we produce Muscat D'Asti DOCG. 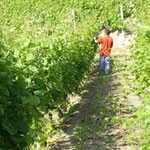 Possessing approximately 25 hectares of vineyard, I worked the vines along with my wife, at times alone. 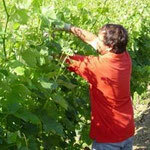 I could not handle it any longer during Spring seasons, so I hired double staffs and attended to the grapes putting up shoots and positioning them in the right position for a better growth, giving them special treatments that effected lopping etc. 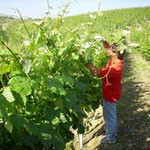 When the grapevines bloomed after winter and the heat started, the disposition lasted a short period which affected all the work previously done. This caused delays of throwing the shoots which lengthened into weeks. Which presented a danger and risk of breaking them; due to the fact they are folded up, and then inserted into intermediately fixed threads, causing damage to the grapevines. At first, I used a joint thread that was ecologically digested; the thread was tied to the head pole and bit by bit, was fastened in series of zig zag knots attaching the shoot using a special car. This was a very slow solution, and very expensive when it comes to human resources. The next solution we tried was fixing spacer in anti-rotation position on half pole. When the vegetation reached a certain length, some plastic threads were placed, that allowed less work, when thrown on the shoots. The same craftsmanship performed at the superior end of the poles. On another vineyard where we produce a different type of grapes, I've discovered spacer springs instead, throwing the iron threads creating the so-called binary plant (the threads flows in long parallel lengths in rolling distanced each, by the springs of around 50 cms). To a certain length of the shoot, then narrowed (self extending and succeeding in picking up little vegetation, therefore the springs didn't work as they should) the spring is elevated half way high on the pole inflating extremity. Using at least 80% of the spring, it's better for the vegetation to grow within the space of the threads created by the springs. I have narrowed more than 2 hectares all alone in a day. 25 hectares of my grapevines are endowed with this system; the savings of this system are clearly evident with less time and manpower needed. Using the spacer springs system; I have harvested the best products, in terms of both quantity and quality. Extreme blooming with good irrigations' (the pollination, blossom of grapes) effect the treatments, this system favours the penetration of the sanitary garrisons. Grape has the best solar exposure that allows maturation, increasing depth of (saccharine), making it definitely an unmistakable product. Accessories for Vineyards thanks so much Mr. MARINO CAFFA for his consistent service. Thanks to his experience Accessories for Vineyards improved its SPACERS FOR THE VINEYARD FOR ANY TYPE OF POLES. 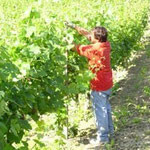 The new products launched on the market by Accessories for Vineyards are also the result of his experience on the field effective which allowed the company to enter new markets outside the borders of Europe.